ITANAGAR, May 6: The Green Hub Festival-2018 is all set to begin from 11 May at the GBR auditorium of Tezpur University, Assam. Held every year to create awareness towards wildlife, environment, biodiversity and social change of the Northeast, the three-day festival is open to all. 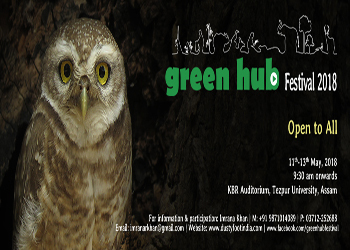 During the event (11-13 May), films on wildlife, environmental conservation and similar issues of acclaimed filmmakers, Green Hub fellows and participants will be screened. Panel sessions will be held with experts to discuss and debate on critical challenges to environmental conservation and social development. Winners of the art and filmmaking contest will also be awarded on the occasion. Interested filmmakers and environmentalists can visit their Facebook page: https://www.facebook.com/greenhubfestival/.